As part of their “global cost review” which began last year, the WBA group is looking at the viability of some of its 2,500 stores in the UK which could potentially lead to some closures. WBA stated that it has already been taking “decisive steps” to cut costs in the UK in recent months as part of the restructuring programme to get itself back on track, however the global cuts target has now been increased from $1 billion to in excess of $1.5 billion of annual expenditure. This is likely to have a material impact in the UK and it was already revealed in February that up to 350 jobs were at risk at Boots UK head office in Nottingham due to the restructuring plans. You can read the PDAU response here. Paul Day, Director of the PDA Union said: “It’s well known that we have just secured recognition at Boots after an eight year campaign that will finally force the company to respect the wishes of pharmacists to be represented by an independent trade union. We are literally at the very beginning of talks to agree how we will work together and that includes how we will deal with potential redundancy situations, like those that could come from this announcement. Redundancies are not the only consequence of this announcement and the company has said that poor trading results may also have an effect on future pay and bonuses for Boots pharmacists. Walgreens is of course a huge and complex enterprise, and their financial position is not purely down to Boots, however as far as the contribution Boots UK makes to its overall operation, we are also aware of the impact of the cuts made by NHS England to community pharmacy. Boots’ operating model and scale may make it more resilient to those cuts than its smaller competitors, but this announcement shows that it too could close stores. As health professionals, PDA members are also concerned about the impact a reduction in community pharmacies could have on patient care. It is often the case in any sector that once one key player starts to close stores, others follow suit and communities should not suddenly find they have insufficient access to a pharmacist. The PDA are calling this potential trend out in advance and once again challenging politicians and senior civil servants with responsibility for community pharmacy to realise the potential of community pharmacy. It is the most accessible part of the NHS and the dedicated health professionals that work there could be doing so much more to help improve the health of the nation. Any PDAU member can contact us in confidence to talk about any workplace concern or query, including redundancy. 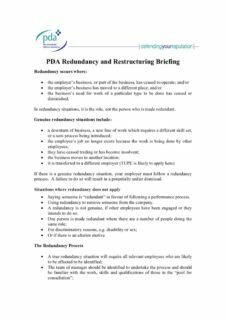 A generic PDAU briefing about redundancy is available below and pharmacists can understand the redundancy process; however the union recommend that members get specific advice based on their own circumstances should a potential redundancy situation occur. If any PDAU member becomes aware that their job is at risk of redundancy they should contact us without delay. We are concerned for the general well-being of members affected by such situations and in addition to the support and representation available from the PDAU, we would also like to remind pharmacists of the excellent personal support provided by Pharmacist Support.